Arrest is latest blow to sport's already stained image. MADRID — The executive who oversaw Spain’s rise to dominate world soccer in recent years was arrested Tuesday in an anti-corruption investigation, dealing yet another blow to the sport’s already-tarnished image. The elder Villar, who has led the Spanish Football Federation for three decades and is the senior vice president of FIFA and a vice president for the European football organization, is suspected of having arranged matches for Spain that led to business deals benefiting his son, said the office of the state prosecutor in charge of anti-corruption. Angel Maria Villar is a longtime power broker in football both inside and beyond Spain’s borders, and he was singled out for questionable conduct in the 2014 FIFA report on the World Cup bidding process that rocked the sport. A 2015 U.S. investigation into corruption in world soccer led to the eventual resignation of longtime president Sepp Blatter and other top officials. Several hours after Tuesday’s arrests, police escorted Villar into the federation offices in Las Rozas, on the outskirts of Madrid. He emerged from a Guardia Civil vehicle flanked by two uniformed agents. Two policemen guarded the entrance to the federation offices near the training grounds for Spain’s national teams. Also arrested were Juan Padron, the federation’s vice president of economic affairs who is also president of the regional federation for Tenerife, and Ramon Hernandez, the secretary of that regional federation. The four were arrested on charges of improper management, misappropriation of funds, corruption and falsifying documents as part of an inquiry into the finances of the federations. Police began the investigation in early 2016 after a complaint from Spain’s Higher Council of Sport, the government’s sports authority. Unregulated by FIFA, friendly matches between national teams can be more easily corrupted. Scandals in recent years involving FIFA were tied to the siphoning of cash from deals struck for friendly matches, often held in North and South America. Gorka Villar, a lawyer, worked in recent years for the South American body CONMEBOL as legal director and then as the CEO-like director general for three presidents who were implicated in the U.S. investigation. Gorka Villar left CONMEBOL in July 2016. The prosecutor’s office said it also suspects that Padron and the Tenerife secretary “favored the contracting of business” for their personal benefit. Calls by The Associated Press to the Spanish and Tenerife federations went unanswered. UEFA said in a statement it was aware of the reports regarding Villar, but “we have no comment to make at this time.” The Higher Council of Sport said it will “use everything in its means to ensure that competitions are not affected” by the arrests. In the wake of the arrests, the Royal Spanish Federation of Football postponed meetings to draw the Spanish football league schedule. A former professional player, the 67-year-old Villar has been the head of Spain’s soccer federation since 1988, overseeing the national team’s victories in the 2010 World Cup and the 2008 and 2012 European Championships. Villar won an eighth term as president in May, running unopposed after another candidate, Jorge Perez, withdrew to protest what he called irregularities in the election of the federation’s general assembly. He has been at the heart of FIFA and UEFA politics since the 1990s, and has worked closely with several international soccer leaders who have since been indicted by the U.S. Justice Department. Villar was a tough midfielder for Athletic Bilbao and Spain before retiring to work as a lawyer and soccer administrator. He was elected to the UEFA executive committee 25 years ago, and to FIFA’s ruling committee 19 years ago. He has also been an influential figure in the legal and referees committees of both organizations. He led the Spain-Portugal bids for the 2018 and 2022 World Cup competitions. In 2010, FIFA’s ethics committee investigated an alleged voting pact involving South American countries. Russia won the bid for 2018 and Qatar won for 2022. His conduct in a wider 2014 probe of the bids was singled out in a 2014 report by then-FIFA ethics prosecutor Michael Garcia. Increasingly seen as a polarizing figure, Villar decided against trying to succeed Michel Platini as UEFA president last year. Before joining CONMEBOL, Gorka Villar was a prominent sports lawyer in Madrid. He helped represent cyclist Alberto Contador in a failed appeal at the Court of Arbitration for Sport of a positive doping test that cost him the 2010 Tour de France title. 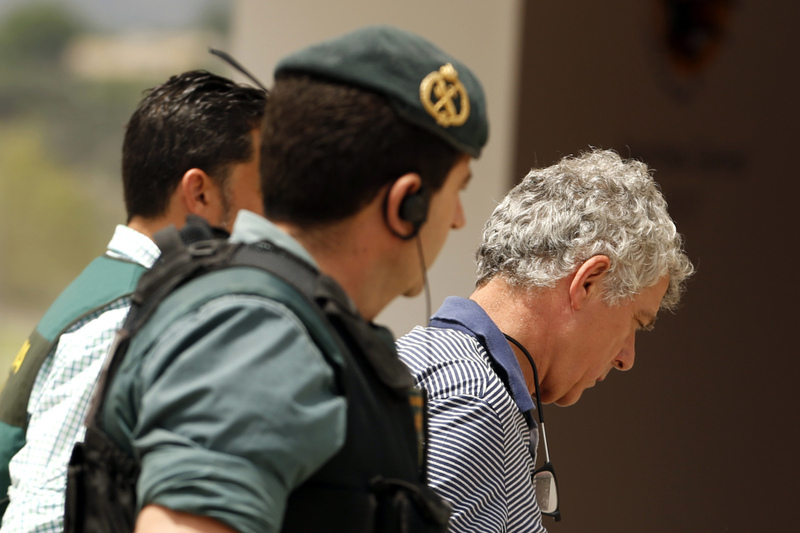 The arrests are the latest step by Spain to crack down on financial wrongdoing in soccer. Last year, Barcelona forward Lionel Messi and his father were found guilty of tax fraud. In recent weeks, prosecutors have opened tax fraud investigations into several others, including Real Madrid forward Cristiano Ronaldo and former Madrid coach Jose Mourinho. Both Ronaldo and Mourinho deny cheating on their taxes.